It is the first Millenium, BC. The location is the Eastern Mediterranean. Groups of people banded together in city-states, and through conquest and commerce, they rose to prominence. It was an era where many separate kingdoms and individuals each had their own distinct moment “in the sun”. This is the world of Gentes, where players will guide their civilization through the ups and downs of history, trying to make sure they are the one who makes a permanent mark in the annals of history! 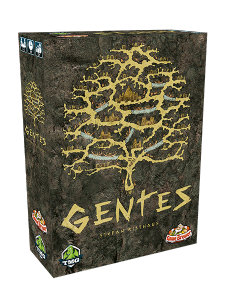 Gentes is a civilization game with an innovative timing mechanism. Players take the role of an ancient people who are attempting to develop by building monuments and colonizing or founding new cities in the Mediterranean sea. Designed by Stefan Risthaus (Arkwright), this civilization game is for 2-4 players and will last around 90 minutes. While training priests, soldiers, merchants, artisans, and scholars, players will establish and populate significant cities, while creating monuments that will glorify their greatness to those who see them in the future.